Does artemether–lumefantrine administration affect mosquito olfactory behaviour and fitness? Artemisinin-based combination therapy (ACT) is the recommended treatment against uncomplicated Plasmodium falciparum infections, and ACT is widely used. It has been shown that gametocytes may be present after ACT and transmission to mosquitoes is still possible. Artemether–lumefantrine (AL) is a broadly used artemisinin-based combination medicine. Here, it is tested whether AL influences behaviour and fitness of Anopheles mosquitoes, which are the main vectors of P. falciparum. 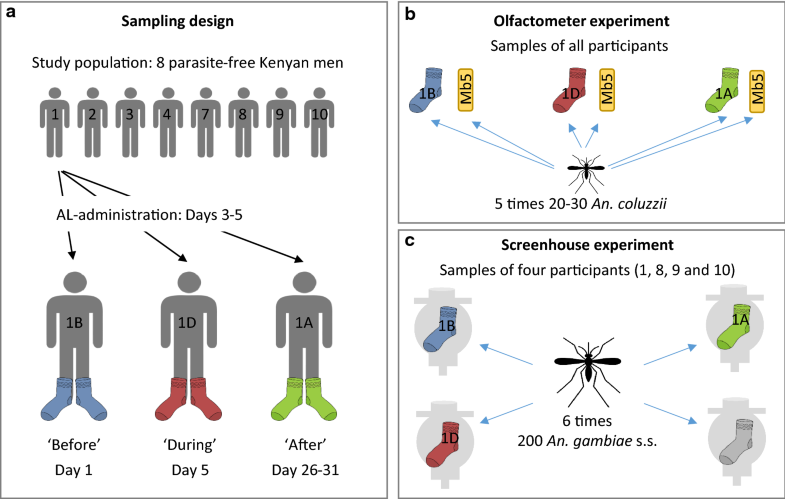 Dual-choice olfactometer and screenhouse experiments showed that skin odour of healthy human individuals obtained before, during and after AL-administration was equally attractive to Anopheles coluzzii and Anopheles gambiae sensu stricto, apart from a small (but significant) increase in mosquito response to skin odour collected 3 weeks after AL-administration. Anopheles coluzzii females fed on parasite-free blood supplemented with AL or on control-blood had similar survival, time until oviposition and number of eggs produced. Based on the results, AL does not appear to influence malaria transmission through modification of vector mosquito olfactory behaviour or fitness. Extending these studies to Plasmodium-infected individuals and malaria mosquitoes with parasites are needed to further support this conclusion. Artemisinin-based combination therapy (ACT) has been the recommended treatment against uncomplicated malaria caused by Plasmodium falciparum since 2002 . It is also often used against other Plasmodium species. In 2016, over 400 million doses were distributed, with the large majority being administered in Africa . ACT has made a significant contribution to the reduction in malaria cases observed between 2000 and 2015, supporting their important role in malaria control . ACT quickly reduces malaria symptoms and densities of asexual malaria parasites , while it can also reduce gametocyte carriage and malaria transmissibility compared to non-ACT medicines [5–8]. A recent meta-analysis concluded that the most widely used ACT medicine, artemether–lumefantrine (AL), is superior to non-ACT medicines in reducing gametocytaemia and malaria transmission . Nevertheless, ACT has a limited effect against mature gametocytes, and gametocytes can still be transmitted from P. falciparum-infected patients following ACT [10–14]. Gametocytes are transmitted to mosquito females when they take a blood meal from infectious humans, and, after parasite development in infected mosquitoes, malaria parasites are transmitted to humans in the form of sporozoites, again during blood feeding. Anopheles gambiae sensu lato (s.l.). and Anopheles funestus s.l. are the most important vector species in sub-Saharan Africa , partially due to their strong preference for blood feeding on humans . To find a host, mosquito females use volatile cues emanating from the skin, besides CO2 that is associated with the presence of all vertebrate hosts. In An. gambiae sensu stricto (s.s.) and Anopheles coluzzii, siblings within the An. gambiae species complex, anthropophilic biting behaviour is associated with a strong preference for human skin odour over skin odour of other vertebrate host species [e.g. 17]. Surprisingly, there are no studies on the possible effects of ACT on malaria-transmitting mosquitoes. Yet, it is important to investigate such effects because transmission of gametocytes to mosquitoes is still possible after ACT as described above [e.g. 14]. The rate of post-treatment transmission could be influenced if ACT has an effect on the attractiveness of treated individuals and consequently on the probability of contact between ACT-treated humans and mosquitoes. Several factors are known to affect human attractiveness to mosquitoes through effects on skin odour composition, including infection with malaria parasites . Here, the effect of AL on the attractiveness of parasite-free humans is assessed by studying mosquito responses towards their skin odour. The rate of malaria parasite transmission could also be affected by ACT, if ACT would directly affect the lifespan of infected mosquitoes and consequently the probability of parasites within the mosquito reaching the sporozoite stage. Female mosquito fitness was therefore studied when females take a blood-meal supplemented with AL. Although Plasmodium infection may affect mosquito survival [e.g. 19], and the effects of ACT may be different in infected mosquitoes, uninfected mosquitoes were used in this study as a first investigation of the potential endectocidal effects of ACT against Anopheles. The mosquitoes used for the laboratory experiments in Wageningen, The Netherlands, were from a colony of An. coluzzii , which originated from Suakoko, Liberia. The colony has been reared in the laboratory since 1987 according to methods described by de Boer et al. , and membrane-fed on human blood (Sanquin Blood Supply Foundation, Nijmegen, The Netherlands) in the presence of human odour (from a worn sock) and 5% CO2. Newly emerged mosquitoes were supplied with 6% glucose but no blood prior to experiments. Female mosquitoes were approximately 7 days old when they were used in the fitness experiment, and approximately 8 days old in the olfactometer experiment. Experimental mosquitoes were selected in the afternoon prior to the start of an experiment and provided with water only until use. The semi-field experiments were performed at the Thomas Odhiambo Campus of the International Centre of Insect Physiology and Ecology (ICIPE) in Mbita, western Kenya. A laboratory colony of An. gambiae s.s., originating from Mbita and kept in the laboratory since 2001, was reared according to methods described by Busula et al. and fed three times per week on a human arm. Experimental mosquitoes (2 to 7 days old) were collected in the morning, and kept with water only until the start of an experiment the same evening. The samples used for the attractiveness experiments were collected from eight non-smoking Kenyan men between 20 and 40 years old. Their blood was tested for the presence of Plasmodium parasites through RDT and nested PCR on a fragment of the 18S rRNA gene . Individuals with an in-ear temperature higher than 37.5 °C, or carrying Plasmodium detected by either diagnostic method were excluded. Participants were asked not to use alcohol and spicy food for 24 h before, and during sample collection. They were also asked to take their last shower before sample collection without soap, and not to shower during sample collection. Odour samples were obtained by wearing a pair of nylon socks (97% polyamide, 3% elastane, 20 denier, HEMA, The Netherlands) for approximately 20 h. Nylon socks were washed with 70% EtOH before use and dried in an oven at 70 °C for 2 h. ‘Before’ samples were collected on day 1 of the trial. On day 3, the participants started with a 3-day course of anti-malarial treatment at the same dose and for the same duration as recommended for uncomplicated malaria, i.e. six doses of four tablets containing 20 mg artemether and 120 mg lumefantrine per tablet at intervals over 3 days . ‘During’ samples were collected on day 5 (i.e. on the final day of anti-malarial treatment) and ‘after’ samples were collected between day 26 and 31 of the trial (Fig. 1). Artemether and lumefantrine have a half-life of about 2 h and 3–6 days, respectively [23, 24], so 3 weeks should be sufficient to ensure that only small amounts of lumefantrine (between approximately 0.5 to 5%) and no artemether are left in the body. A new pair of socks was used for each sample. The odour samples were stored in the freezer at -20 °C until use and between experiments. Surgical gloves were worn during all handling to avoid contamination with human skin odour. Ethical approval for this study was obtained from the Kenyan Medical Research Institute (Non-SSC protocol 389) and all participants provided informed signed consent. The attractiveness of odour samples of all participants was tested in a dual-port olfactometer with three identical flight chambers (Tupola, The Netherlands), according to methods described by Verhulst et al. . Before use in the olfactometer, the foot-part was removed from one worn sock of each sample. Half of the remaining leg-part (approximately 30 by 5 cm) was used as the test odour source in the olfactometer trap. The other trap contained a nylon strip (26.5 × 5 cm) baited with the Mb5 blend—a synthetic human odour mimic —to obtain a relative measure of attractiveness of each skin odour sample (Fig. 1). Charcoal-filtered, moist and heated air (23.9–32.8 °C [95% confidence interval, CI]) was blown through the two trapping devices at a wind speed of 0.2 ± 0.05 m/s. Temperature inside the flight chambers was 25.1–28.3 °C (95% CI), and humidity was 55–74% (95% CI). The experimental room was heated to 25.6–28.4 °C (95% CI) and had a relative humidity of 39–55% (95% CI). CO2 (5%) was provided at approximately 175 mL/min at 5 cm below each trap entrance. Each sample was tested once in five of the six positions of the olfactometer over five different days to obtain a thorough assessment of its attractiveness. In every test, 20 female An. coluzzii were used, with the exception of the first replicate for each sample, for which 30 mosquitoes were released. The eight participants were divided in two groups, which were tested on different days, with the three sample time points per participant kept together in one group. Each Mb5-baited strip was used in only one dual-choice test per day, and stored at 4 °C between experimental days. 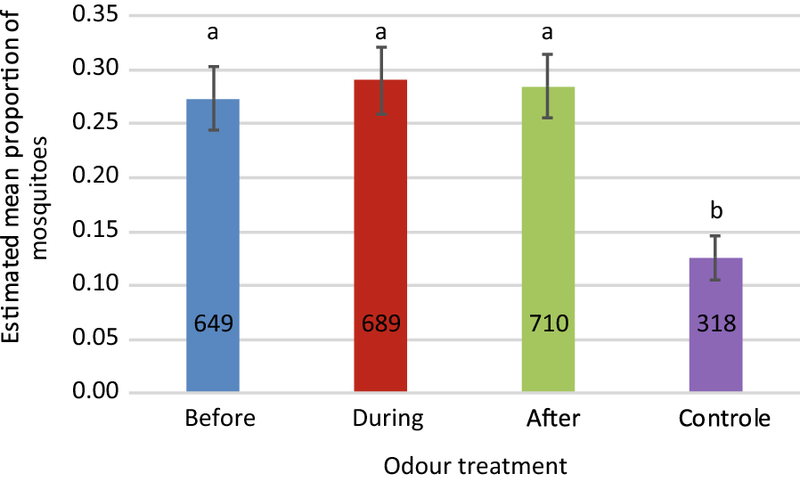 Skin odour samples collected from four randomly selected participants were used to directly compare attractiveness of samples obtained before, during and after AL-administration per participant. Experiments were conducted as described before [17, 27], in two greenhouses (7 × 11 × 2.5 m) with glass-panelled roofs and gauze-covered sidewalls with sand on the floor. MM-X traps (American Biophysics Corp., North Kingstown, USA) were placed in each corner and baited with a nylon sock of each of the three sampling moments or a new unworn sterile nylon sock as a control (Fig. 1). The traps were each assigned to a specific treatment. The MM-X traps were provided with CO2 from fermented sugar [17, 27]. Each test started with trapping devices cleaned with 70% EtOH, and new mosquitoes were used for every experiment. The greenhouse was set for the experiment 2–5 h before the start by removing remaining mosquitoes, spiders, spider webs and by moistening the sand in the greenhouse. Two hundred female An. gambiae s.s. mosquitoes were released from a paper cup at the centre of the greenhouse at 20.00 h. In the morning (7.00 h), the traps were collected, placed in a freezer and trapped mosquitoes counted. Samples of the four participants were each tested six times, and participants were alternated between the testing nights. Within participants and between replicates, the traps were randomly rotated among the different corners of the greenhouse. One day before the start of the experiment, two groups of forty An. coluzzii females were placed inside mesh cages (15 × 15 × 15 cm), and provided with tap water on cotton wool. The next morning, during the last 3 h of the scotophase, a membrane with 1 mL human blood was placed on top of each cage. In the AL-treatment group, the membrane contained blood to which dissolved AL was added. In our in vitro assay, we used the concentration of one dose of AL (4 times 20 mg artemether and 120 mg lumefantrine) in the volume of blood of an adult person (6 L). This concentration is 10–100 times higher than peak levels reached in vivo, which also depend on food intake and presence of Plasmodium parasites [24, 28, 29]. In vivo, artemether and lumefantrine also have different ratios because of differences in half-life and they are metabolized into different active compounds in the human body. A suspension of an AL tablet was made in PBS at a concentration of 0.29 mg/mL artemether and 1.71 mg/mL lumefantrine. Fifty µl of this suspension was added to 950 µL blood resulting in a concentration of 13.3 µg/mL artemether and 80 µg/mL lumefantrine. The control group received 950 μL blood to which 50 μL PBS was added. A few hours after feeding, all visibly blood-fed mosquitoes were photographed using a camera mounted on a stereomicroscope to measure wing length, using ImageJ software. To immobilize mosquitoes, they were placed in glass vials on ice for about 30 s and then transferred to a Petri dish with ice, placed under the microscope. Mosquitoes were then placed individually in a paper coffee cup (150 mL), which contained a smaller plastic medicine cup (25 mL) filled with tap water and a cone-shaped filter paper (diameter 9 cm) for oviposition. Paper cups were covered with mesh and 6% glucose solution was provided on cotton wool on top of the mesh. Experimental mosquitoes were kept in a climate room under the same conditions as the colony. Survival and oviposition were monitored daily for 14 days to record the day that the first eggs were laid and the day of death. When eggs were found, the filter paper was replaced and the eggs were counted using a stereomicroscope. Three experimental series were done with approximately 40 mosquitoes per group per series. Mosquitoes caught on the skin odour samples and controls were summed over the five testing days before statistical analyses, accounting for the non-independence of the repeated attractiveness measures per sample. Two parameters were defined to evaluate the effect of AL-administration. Relative attractiveness was calculated as the mosquitoes caught in the trap baited with the skin odour sample as a proportion of the total number of mosquitoes caught in both traps (i.e. caught on the sock and on the Mb5-baited strip). Mosquito response was calculated as the number of mosquitoes caught in the trap baited with the skin odour sample divided by the number of mosquitoes that left the release cage in that particular test, i.e. irrespective of the mosquitoes caught on the control odour. Generalized linear models (GLM, Binomial distribution, logit link function, deviation estimated) were used to statistically analyse the effect of AL-administration on these parameters separately. The number of mosquitoes caught in the trap with the skin odour sample was used as the response variable in both models, while binomial totals were the total number of mosquitoes in both traps for relative attractiveness, and the number of mosquitoes that left the release cage for mosquito response. Participant identity was included in the models to account for variation in intrinsic attractiveness between individuals . Differences between sample time points were tested by pairwise comparisons using least significant differences at the 5% level (LSD). Relative attractiveness of each sample was also evaluated with Binomial tests on the numbers of mosquitoes caught on the skin odour sample or on the control, and comparing it to 0.5. A binomial GLM was used to evaluate the effects of treatment (sampling time point relative to AL-administration or control odour), participant and their interaction on the proportion of mosquitoes trapped by the different odour samples. The number of mosquitoes per trap was used as the response variable and the total number of mosquitoes trapped per experimental night per screenhouse was used as the binomial total. Position of the trap within the screenhouse was also fitted in the GLM because it had a significant effect on mosquito catches. Mosquito survival after blood-feeding and time until oviposition were compared between the AL and control group with a Kaplan–Meier survival test using the long-rank Mantel-Cox χ2 statistic. Only mosquitoes that laid eggs were included in the analysis of time until oviposition. To examine if AL affects the proportion of blood-fed mosquitoes that laid eggs, Fisher’s exact probability test (2 × 2 contingency table) was used. A Poisson GLM (log-link function) was used to test the effect of AL on the number of eggs produced. Treatment, series and the interaction were included in the model, and wing length was used as a covariate because mosquito fitness is known to be associated with size . Non-significant (P > 0.05) terms were dropped from the final model. Statistical analyses were done with SPSS software, version 24 (IBM Corp.). For all 24 skin odour samples (before, during or after AL-administration of each of eight participants), the worn sock attracted significantly more mosquitoes than the control Mb5 bait (Binomial tests, P < 0.001, Fig. 2). Mosquito choice for worn socks ranged between 79 and 100%, and was not affected by sampling time point, i.e. before, during or after AL-administration (GLM, P = 0.712, Fig. 3a) or participant (P = 0.186). The mosquito response to skin odour samples was more variable, ranging from 31 to 83% of mosquitoes that flew in the olfactometer being trapped on the skin odour sample (Fig. 2). Mosquito response to worn socks was significantly affected by sampling time point relative to AL-administration (GLM, P = 0.026, Fig. 3b). Significantly more mosquitoes responded to skin odour collected after AL-administration than to skin odour collected before or during AL-administration (GLM, LSD, P = 0.014 and P = 0.020, respectively). Mosquito responses to skin odour collected before or during AL-treatment were statistically similar (GLM, LSD, P = 0.914). Participant identity had a significant effect on mosquito responses to skin odour (GLM, P = 0.033), with participant #3 attracting significantly fewer mosquitoes than most other participants, except participants #2 and #10 (Fig. 2 and Additional file 1: Table S1). Direct comparisons of mosquito attraction to skin odour collected from individual participants at different sampling time points relative to AL-administration was tested in a screenhouse. Four of the eight participants were randomly selected for this experiment, and tests for each participant were repeated on six different nights for a total of 24 experiments. Of the 4800 mosquitoes released, 2366 An. gambiae were caught (49%). The response of An. gambiae to traps baited with skin odour samples and CO2 was significantly higher than to the control traps that were baited with clean socks and CO2 (GLM, P < 0.001). Mosquitoes did not differentiate between skin odour samples collected before, during or after AL-administration (GLM, LSD, P > 0.691, Fig. 4). Out of approximately 120 An. coluzzii mosquitoes that were provided with AL-blood, 82 females were considered blood-fed and were included in the fitness experiment. For the group fed on control-blood, 72 out of 120 mosquito females had blood-fed. Survival of mosquitoes fed on AL-blood and control-blood was statistically similar (Kaplan–Meier, Mantel-Cox χ2 = 1.582, d.f. = 1, P = 0.208, Fig. 5), with a median survival of 11 days after blood feeding for the control group and 12 days for the mosquitoes fed on AL-blood. Feeding on AL-blood did not influence the proportion of mosquitoes that oviposited after taking one blood meal: 59% of AL-blood fed mosquitoes laid eggs, while 65% of control-blood fed mosquitoes laid eggs (Fisher exact probability test, P = 0.411). AL did not significantly affect time until oviposition with a median of four days after blood-feeding in both groups (Kaplan–Meier, Mantel-Cox χ2 = 2.837, d.f. = 1, P = 0.092, Fig. 5). Finally, the number of eggs laid by females fed on AL-blood (40.30 ± 3.47) was statistically similar to that of mosquito females fed on control-blood (44.83 ± 3.66) (GLM, P = 0.370, Fig. 5). Malaria mosquitoes rely on skin odour to find their human host [e.g. 31], and many factors contribute to interindividual variation in attractiveness of healthy humans . Here, the influence of anti-malarial treatment with ACT on human attractiveness to malaria mosquitoes was investigated. This is relevant because ACT has a limited effect against gametocytes, which can lead to post-treatment gametocytaemia and transmission to mosquitoes. A recent meta-analysis showed that approximately 25% of patients that report with gametocytes, may still carry gametocytes 1 week after AL-treatment, the most common form of ACT currently used in Africa . This proportion gradually decreases over the course of the next few weeks. Several studies demonstrated that post-treatment gametocytaemia can indeed result in transmission to mosquitoes 1 week after anti-malarial treatment with ACT [13, 32]. Skin odour samples collected from healthy participants on the final day of a three-day administration course with AL had the same attractiveness as skin odour samples collected before AL-administration. This was shown in a dual-port olfactometer in the laboratory with An. coluzzii and in semi-field experiments with An. gambiae s.s., both members of the An. gambiae species complex. This suggests that the attractiveness of human skin odour to these malaria-transmitting mosquitoes is not altered during administration of AL to healthy persons. Skin odour samples collected three weeks after completion of AL-administration attracted significantly more mosquitoes than skin odour samples collected before or during administration (Fig. 3b), although mosquito choice was not influenced (Fig. 3a). This effect was only observed with An. coluzzii in the dual-port olfactometer and not with An. gambiae s.s. in the semi-field experiment, perhaps due to the experimental set-up or the smaller number of participants tested in the latter experiment. To ensure that increased attraction was caused by AL-administration, and not by other factors that changed over time and influenced attractiveness to mosquitoes, e.g. climatic factors, diet or physical activity, it would have been necessary to include skin odour samples from participants that had not received AL. However, other studies suggest that human skin odour and differential attractiveness of healthy humans to mosquitoes is stable over time, although very few studies have actually tested this [33, 34]. If increased attractiveness at three weeks after AL-treatment can be confirmed in Plasmodium-infected patients, the question is whether this is meaningful in terms of transmission. Post-treatment gametocytaemia is also found at this time point but it occurs in less than 5% of treated patients that report with gametocytes , and no studies have investigated whether treated patients can infect mosquitoes at this time point. Due to this low percentage, and the relatively small increase in mosquito response to skin odour (from 52 to 66% of mosquitoes attracted), the impact of this finding on malaria transmission from humans to mosquitoes is limited at most. Ultimately, it is essential to investigate if these findings can be translated to AL-treated Plasmodium-infected persons. Plasmodium-infection is known to influence human attractiveness to mosquitoes [35–37] through changes in skin odour profile , and gametocyte-infected red blood cells can emit mosquito-attractants . It is possible that there are interactions between ACT and Plasmodium-infection that are not seen in healthy participants after administration of ACT. Direct effects of AL on mosquitoes were also investigated by feeding females on human blood supplemented with AL. Results of the in vitro experiment suggest that uninfected An. coluzzii is not affected by the drug because time until oviposition, the number of eggs in the first egg batch, and survival were the same in mosquitoes fed on control- or AL-blood (Fig. 4). Based on what is currently understood about their mode of action against Plasmodium parasites [23, 39, 40], it was not expected that artemether and/or lumefantrine would affect fitness of An. coluzzii. However, differences between results in the in vitro assay and in vivo effects could arise from exposure of mosquitoes to different metabolites of artemether and lumefantrine, and different concentrations of and ratios between metabolites. In vivo, artemether and lumefantrine are quickly metabolised into dihydroartemisinin and desbutyl-lumefantrine, respectively [24, 41]. Artemether and lumefantrine have low solubility in water and due to differences in half-life , ratios between the metabolites would be different in vivo. Feeding mosquitoes on blood of ACT-treated patients could overcome these limitations. Moreover, effects may be different in mosquitoes that ingest ACT at the same time as gametocytes because there may be interactions between drugs and parasites. To verify this, it would be necessary to perform tests with Plasmodium-infected mosquitoes. Despite these limitations, our findings suggest that mosquito fitness will not be influenced by blood-feeding on ACT-treated humans, in contrast to the endectocidal drug ivermectin that proved to have a significant impact on malaria transmission through its effect on Anopheles mosquitoes . Perhaps surprisingly, there is a scarcity of studies on the effects of medication on human body odour profiles and attractiveness to mosquitoes, with the exception of a study from 1968 testing drugs and diseases as potential repellents against Aedes mosquitoes . Here, the potential effects of AL on behaviour and fitness of malaria mosquitoes were studied. The experiments provided no evidence for a major effect of AL on human attractiveness to An. coluzzii and An. gambiae s.s., apart from a small increase in attractiveness 3 weeks after AL-administration. To predict whether this has any effect on post-treatment parasite transmission, it is essential to repeat our study with Plasmodium-infected participants. Further, it is recommended that these experiments are repeated with other commonly used ACT medicines, particularly those that have limited gametocytocidal effects. For example, a recent study reported that the appearance of gametocytaemia after ACT-treatment was higher when artesunate/amodiaquine and dihydroartemisinin–piperaquine were used compared to AL . No effect of AL on fitness parameters of An. coluzzii was found. Based on these results, it appears unlikely that AL alone has an effect on post-treatment transmission through direct or indirect effects on Anopheles mosquitoes. JGdB designed the research, and analysed and interpreted the data alongside AOB, JtB and TSvD. JGdB, AOB, JtB and TSvD performed the experiments. WT contributed to interpreting the data and writing the manuscript. JGdB wrote the manuscript. All authors read and approved the final manuscript. We thank Geoffrey Olweru and Anthony Kibet for assistance with Plasmodium detection for inclusion of participants, Sean Sauren for collecting research materials and Daniel Masiga for help in the application for ethical approval. We also acknowledge all participants of this study. We are grateful to David Alila for providing the mosquitoes used in the semi-field experiments in Kenya, and to Léon Westerd, Frans van Aggelen and André Gidding for providing mosquitoes used in the laboratory experiments at Wageningen University. This work was supported by a TOP grant of the Netherlands Organisation for Health Research and Development (ZonMW, Grant Number 91211038) awarded to WT. All data generated or analysed during this study will be included in the supplementary information files of this published article. Ethical approval for this study was obtained from the Kenyan Medical Research Institute (Non-SSC protocol 389) and all participants provided informed signed consent. This work was funded by the Netherlands Organisation for Health Research and Development (ZonMW, Grant number 91211038). The funding agency had no role in experimental design and data interpretation. 12936_2019_2646_MOESM1_ESM.docx Additional file 1: Table S1. Pairwise comparison (LSD) of mosquito response to skin odour of eight participants in the olfactometer assay. Values in bold indicate significant differences. 12936_2019_2646_MOESM2_ESM.xlsx Additional file 2: Table S2. 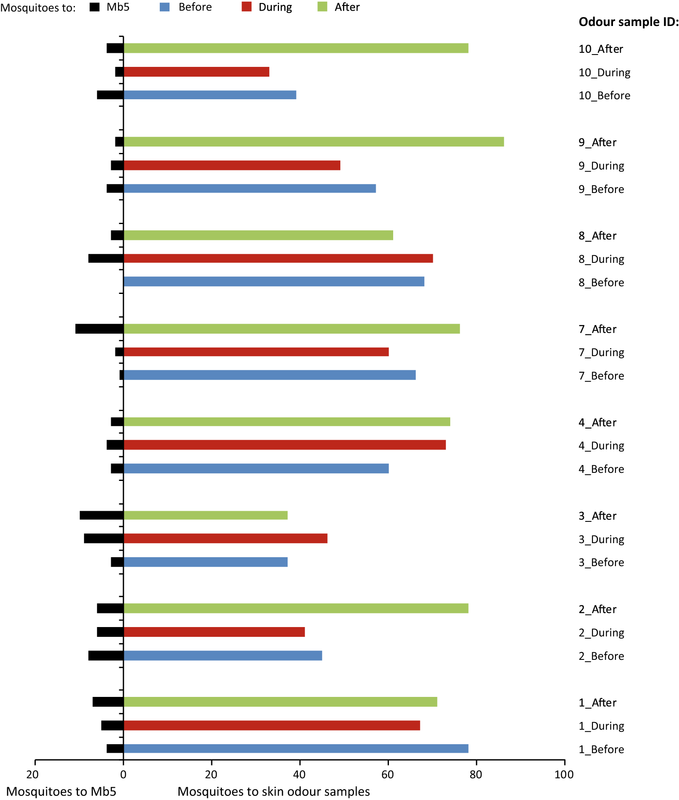 Data generated and analysed in this study, including raw data of the olfactometer experiment, summary of the olfactometer data, screenhouse experiment data and data of the fitness experiment.